This article is about the Super Smash Bros. stage. For other uses, see Mushroom Kingdom (disambiguation). Mushroom Kingdom as it has appeared in the Smash series. Unlock criteria Clear 1-Player mode with the eight starter characters, and play every other stage in Vs. Mode. Main: Ground Theme - Super Mario Bros.
Alternate: Underwater Theme - Super Mario Bros.
Mushroom Kingdom (いにしえの王国, Ancient Kingdom) is the only unlockable VS. Mode stage in Super Smash Bros.. While it does not return in Super Smash Bros. Melee, a similar stage also called Mushroom Kingdom appears. The stage later returns in Super Smash Bros. Ultimate as a familiar stage. This stage is the only one which is never seen in 1-Player mode: even if it is unlocked, Mario and Luigi will still be fought on Peach's Castle. Official art of Mushroom Kingdom from Smash 64. In the middle of this stage is a pit. To the right of it, there are two soft floating platforms, and a pipe to the right of them. To the left of the hole, there is a single floating soft platform, and a solid brick platform left of that which extends to the edge of the stage. In the background, a grey castle can be seen, along with some mushroom platforms. This stage is unique among the ones in Smash 64 in that it features walk-off blast lines: this is even further referenced by a "danger" sign that appears beyond the blast lines themselves. There are three pipes which characters can warp in between. When standing on a pipe, if the player presses down on the controller, their character will transfer through to another pipe. In Ultimate, down must be held for a moment before the pipe will be entered, and after a character travels through one, they cannot use the pipes again for another 13 seconds to prevent abuse of the warps. One of these pipes is on the ground to the right of the stage, and another is on top of the brick platform to the left. There is a third pipe in the left wall of the chasm; in 64 this pipe is exit-only but enterable in Ultimate by holding left while next to it, although there is a chance the pipe will reject the character and immediately spit them back out. Characters are randomly sent to either pipe, although if one pipe is blocked, the character will always come out of the alternate pipe. Additionally, two Piranha Plants occasionally come out of the pipes and inflict low damage (5%), but can be knocked away with a powerful attack. The Piranha Plants knock any characters who hit them straight upward with relatively high base knockback albeit extremely low knockback scaling, usually not KOing until very high percentages. They can be used during combos or to setup moves. Using the pipes is not typically a reliable strategy, as the player may exit into the abyss, which could lead to the player falling down the bottom blast line and self-destructing, or at minimum being left open to attack. In the middle of this stage is a fissure, which is the place players can be KO'd by falling down. Above the crevasse is a scale with two soft platforms. It is possible to stand on the two platforms, but the character's weight will unbalance them. If unbalanced too far, the system will break and fall into the crevasse, and then regenerate a few seconds afterwards. This gap is the cause of many AI flaws. Occasionally, a small, rectangular POW Block will appear in one of several locations in the air. Hitting it with an attack will cause the screen to vibrate, with every character touching the ground or a platform being dealt 20% damage and great knockback. If the hazards are turned off in Ultimate the lift platforms are absent, the Piranha Plants never come out of the pipes, the POW Block never spawns, and players cannot travel through the pipes. In Super Smash Bros. Ultimate, the Ω form and Battlefield form are suspended in the air with no platforms extending below the blast line and no walk-offs. The POW Block, scales, and Warp Pipes are also absent. The main platform is an arrangement of ground blocks that match the size and shape of Final Destination and Battlefield, respectively. In order for fighters to not get stuck in the corners when recovering, and to make this form match their respective forms, there are invisible slopes along both sides. The three soft platforms of the Battlefield form are based off the soft platforms of the regular form. 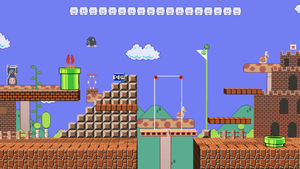 This stage has a variety of elements from Super Mario Bros., some of which can be seen here in World 1-1. This stage is based on the overworld levels of Super Mario Bros., in which Mario can enter Warp Pipes to underground levels or bonus rooms; when underground, the player has to go into another Warp Pipe to return to the overworld. Some Warp Pipes have Piranha Plants that emerge from them as a hazard. There are also certain levels that have scales that have a platform that goes down when Mario is standing on it, while the other platform connected to it goes up. If Mario stands on the platform for too long, the scale breaks and both platforms fall. This stage retains the aforementioned elements; however, the Piranha Plants are red, as in Super Mario Bros.: The Lost Levels from World 4 onward. In the arcade game Mario Bros., the goal is to hit the enemies from under a platform to flip them over, and then get to the top of the platform to kick them off. If the player feels overwhelmed by how many enemies are on the screen at once, the player can go to a POW Block to knock all the enemies on their back. In this stage, if a fighter hits the POW Block that occasionally appears, it launches their opponents upward. There are also many elements in the background that are from Super Mario Bros., such as Koopa Troopas, Mushroom Platforms, a Beanstalk, a Goal Pole, etc. This stage is universally banned in standard tournaments due to hazards such as the POW blocks and randomized Piranha Plants disrupting gameplay, the pipes allowing heavy side camping, and the walk-off blast lines allowing even further side camping and allowing characters who can chaingrab past the blast line (such as Pikachu using its forward throw) to KO at very low percentages. Alongside Sector Z, it has never been considered a legal stage. The stage as it appears in Super Smash Bros.
Piranha Plant firing poison at Toon Link on the stage. Every subsequent installment in the Super Smash Bros. series has had a Mushroom Kingdom based stage (a stage related to "Mushroom Kingdom"; or any name based on that word). Melee had Mushroom Kingdom and the Super Mario Bros. 2-based Mushroom Kingdom II, Brawl had Mushroomy Kingdom, Super Smash Bros. 4 had Mushroom Kingdom U in the Wii U version and Mushroomy Kingdom as a returning stage in the 3DS version, and Ultimate had all of the above except for Melee's Mushroom Kingdom. The pipes that can be drawn on the PictoChat 2 stage in Super Smash Bros. for Nintendo 3DS likely reference this stage, as they can be entered in a similar manner and one of them is situated over a pit. Although pipes also appear in Mushroomy Kingdom, 3D Land, and Super Mario Maker, they cannot be used by the player as they are in this stage or in PictoChat 2. This is the only stage in Smash 64 where the theme music is directly ported from another game, that game being Super Mario Bros. Super Smash Bros. Melee would later feature three stages (excluding Past Stages) where an original music track from another game appears on the stage (one of them as an alternate track), and from Super Smash Bros. Brawl onwards, numerous songs ripped directly from their sources were heard on some of the stages. The German name of this stage translates to "Donut Plains", an unrelated location from Super Mario World. During the final 30 seconds of a time match and Sudden Death, the music will speed up (as it does in Super Mario Bros. when the timer reaches 100 units). This is one of the five stages in the Smash Bros. series to change music when the timer reaches 30 seconds and during Sudden Death, the others are Mushroom Kingdom (SSBM), Mushroom Kingdom II, Suzaku Castle (if the music played is any type of one of the sixteen playable characters in Street Fighter II and Super Street Fighter II) and Moray Towers. This stage and Saffron City share the longest gap between appearances in the Super Smash Bros. series, with nearly twenty years between Smash 64 and Ultimate. This is the only Smash 64 stage to get a major aesthetic redesign for Ultimate, becoming more accurate to the sprites from the original Super Mario Bros. Despite this, the Piranha Plants are still red, as opposed to green like in the original game. Red Piranha Plants do appear in Super Mario Bros.: The Lost Levels, using the same sprite. This is the only playable stage to have no mention on the official Super Smash Bros. website. This is the only Smash 64 stage that shares its name with another stage to not be in Melee. In Ultimate, Peach is the only character who travels to Mushroom Kingdom in Classic Mode. If the Ice Climbers use the pipes, one may not come out of the same pipe as the other. Pikmin and Luma can't use the pipes.